Working with Northern Lights Provisional, tried GSC forthe first time. Wonderful taste, great smell, and meds work well. Almost instantly, RA chronic pain was at a stand still. Thank you again Northern Lights Provisional in Mio, Mi for assisting me with getting the pain under control to live a normal life. Bought at light shade in Denver, got a 7gr of flower, and 2gr of gsc shatter. bud is sugery, good tasting, great aroma.The shatter is great also. Idk if it's the real deal gsc but what I got I am satisfied with. I also got a gr of wax of gsc from the clinic Colorado that was fire also. the jedi I had was better but the gsc wax is great. A++ strain!! Looks: Frost covered tight and very light weight marijuana nuggets with areas of deep "dark" spotting encased in orange/rust colored hair. Smell: A slight hint of pepper with a sweet evergreen funk hitting over the top clearing out the nostrils. Smell can be describe as "minty," but I had to really "detect" it. Taste: A light, but sweet evergreen/spearmint fruit enhanced flavor with a bit of sweet tea leaf after taste. Buzz Type: A combination of heady and heaviness providing some solid focus and spatial awareness along with good pain management and relaxation. * Girl Scout Cookies, "Original Thin Mints" somewhat threw me for a loop when I first started medicating with it. On my very first bowl, my first thought was; "YES! 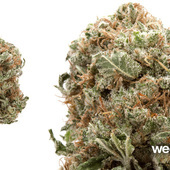 A Sativa that's straight up FIRE!" Fact is, Girl Scout Cookies, "Original Thin Mints" (GSC-OTM) is a hybrid strain that was mostly heavy, but also quite heady; headier than most hybrids I've medicated with going as far back as I can remember. That initial shot of Sativa like headiness stuck with me on the first bowl for a good while until the more dominant heavy and relaxing Indica qualities take over. While feeling "up," GSC-OTM provided me some intense focus and clarity. I was able to get of work done in a short amount of time. I was able to work quite fast. When the heaviness builds up, it feels like someone is taking three of their fingers and pressing against the inside corners of my eyes and bridge of nose. The relief I felt around my eyes was awesome. Very similar to most Kush varieties I've medicated with, but with a little added euphoric feeling. GSC-OTM has a nice initial scent, but the lingering scent can get funky from broken up marijuana nuggets. I found I had to light candles and use spray; not from smoking inside my house, but from after snipping a marijuana nugget. The lingering scent is STRONGER. My wife commented on that several times and although I do not smoke flowers inside my home, I might as well given this flowers lingering smell; which I actually like, but is very noticeable to the "non-user." The majority of the time, GSC-OTM did not couch lock me, but the overall buzz effect could be a bit to heavy for some for day use and this buzz is long; with a typical full bowl consistently hitting the 2+ hour mark with me. Knowing that my overall tolerance could be higher due to more concentrate use, having this long buzz term meant a longer duration of use before depleting supply (a good thing). With GSC-OTM, a little goes a long way. The heaviness of GSC-OTM provided me with great pain relief. I've even made note where my head was pounding me one day from limited sleep and after a bowl of GSC-OTM, I was feeling fine. I really like how this strain was mellowing and relaxing while attacking pain while still providing mental awareness. I enjoyed many "happy hours" while medicated with this strain. When medicating heavy (multiple bowls in a short time span), the come down is noticeable "harder." This is when I get hit with watery eyes and the case of the yawns. A heavier "come down" made me a bit lethargic. Crafted in Northern California, I was very happy to get this strain knowing I received the original directly from SAN FRANCISO. An interesting name for a marijuana strain, sometimes I sit back and wonder how it was named. Is it because the dark spotting makes some marijuana nuggets look like green chocolate chip cookies under the camera? Is it because it crumbles like cookie crumbs when breaking up the marijuana nuggets? When breaking off into little "crumbs," GSC-OTM also burns like a Kingsford charcoal; to a flaky white. Girl Scout Cookies, "Original Thin Mints," has been hyped up quite a bit through the Internet and Pop Culture. But this is one strain that DOES live up the hype. Straight FIRE and my first IE420 "Certified Fire" strain of 2012! There are several variations this "Cookie" strain and do hope I am fortunate enough to come across ALL of them!